Not losing enough? Eat more fat! So you are doing the ketogenic diet for any reason. However, you cannot deny that losing weight is awesome and suddenly it becomes a big deal, you get all exited and want to make sure that you get to weigh your ideal weight and you begin to weigh yourself twice a day! Especially for this diet, I purchased one of those programmable scales that show your body fat percentage, the BMI, the bone mass etc. I like to see the changes in all the numbers. Mainly the change in the BMI, which is a number that is mentioned everywhere when referring to being overweight. 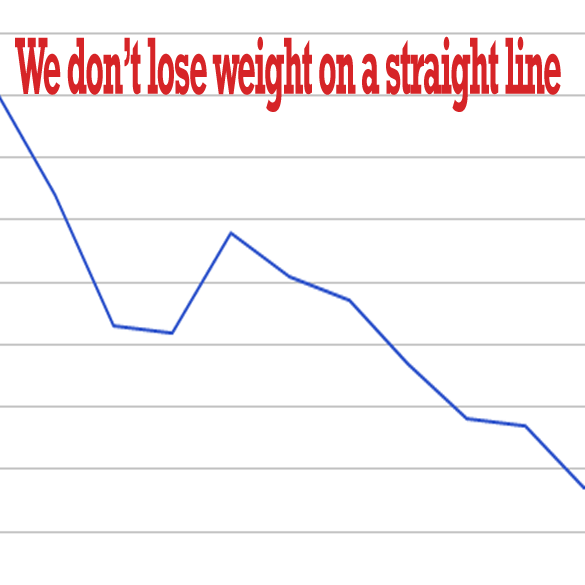 I always thought that losing weight goes down in a straight line. Nope. It goes down, up and down, and up. In general, the line goes down, but it is not straight. Some days, for some reason, you retain more water, some days, even if you do the same thing, you lose more weight than the week before. You slept better; you are less stressed or more stressed. So no, do not weigh yourself every day. Do it once a week on the same day on the same time and track it. I use the FitStream App on my iPhone to track my successes, but if this does not work for you, I am sure that you can find an app that will. Another system is to measure yourself with a measuring tape. Measure all the circumferences and write them down. You can also use an app on your smart phone to track it and have records of your numbers. Some days you will see that there is no difference in the weight but there is a difference in the measurements. As long as one of each shows less than the previous week, you know that you are doing the right thing. If you are stuck in a plateau - Please watch this video by Dr. Berg where he explains why this happens. The video is a little long, but he takes his time to explain.